Green Bay wide receiver John Jefferson came out of the locker room doing somersaults when his name was announced, dishing out hand-slaps to his teammates. The Bucs and cornerback Norris Thomas watched. "J.J. coming out doing those cart- wheels makes you want to play," he said. "Going against a good wide receiver is okay, but being a hot dog doesn't mix well." Jefferson was so excited that he went tumbling to the turf after one high-five. It was an ominous sign. He hit the deck often without the football, catching a low two passes for 26 yards. The Bucs were not ga-ga over J.J. "We went into the game saying we were not gonna play people. We were just gonna stay in our regular zone defense," said Colzie. "His dance kinda got us fired up." 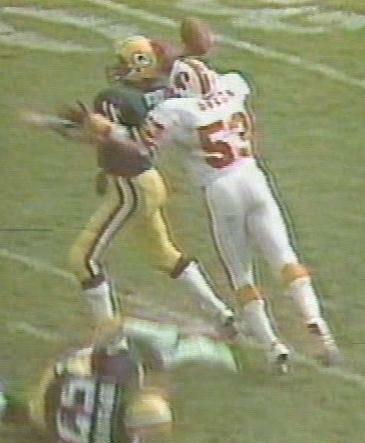 Lofton managed four receptions for 86 yards as the Buc secondary pitched a scoring shutout at the Packer pair. Jefferson and Lofton lifted Green Bay hopes early with a catch apiece as the Pack drove menacingly with the opening kickoff for a 7-yard touchdown run by Gerry Ellis. After that, their decimated offensive line crumbled. Already thinned by injuries, the line was down to skin In' bones when tackle Mark Koncar ducked out of camp last Friday because coach Bart Starr roundly criticized him in a team meeting. One lineman was forced to switch positions. Another who was signed Fri- day had to be rushed into action. "We rattled him, shook him, pressured him eight or 10 times," chimed in nose tackle David Logan. And, from linebacker Richard Wood: "Hey, we tattoed him." The tattoo began to read Born To Lose after the Bucs tied it 7-7. Giles put on an impromptu pass-catching clinic with five grabs, none of them gimmes, that covered 63 of the 85- yard drive. Giles deserved a touchdown, and he got it on a five-yarder that was the final insult to his frustrated defender, John Anderson. Anderson guarded Giles like they were playing basketball - face-to- face, occasionally with his back to the passer. “In your face”, said Giles, who was pleasantly surprised that Anderson drew no backup assistance from his secondary. The third -period won it for the Bucs, a quarter for which they are prone to leave their hearts and their heads in the locker room. Not this time. "Mentally, we were on top," said Wood. "The score was 7-7, but we knew it was our game." The lights went on at the stadium, and the lights went out for the Packers. Williams adjusted the scoreboard to coincide with his team's mental state by whipping the Bucs 65 yards with the second-half kickoff. Jerry Eckwood, who rushed for 84 yards on 22 carries without a fumble, set the wheels turning with a 25-yard dash, and the Bucs did not brake until Williams sneaked 1-yard for the score. In between the Packers made a decision that they lived to regret. A Williams' pass on third down from the Green Bay 23 missed its man, and the Bucs were detected holding. Green Bay could have denied the penalty, which would have left Tampa Bay no option but to try a 41 -yard field goal by Bill Capece, who had sliced one wide from the same distance earlier. Rather, Green Bay accepted the penalty, obviously underestimating the big-play power of Williams. Boom - a 22-yard hook-up with Giles for a first down. The Bucs nearly got a safety on the kickoff when return man Mark Lee kneeled to signal a touchback, only to notice his knee was touching the goal line. Soon, Buc linebacker Cecil Johnson was heading toward the end zone, ball in hand. His fourth interception in three games was also his most significant, seeing as how he was shoved out of bounds inside the 1-yard line. James Wilder (122 yards rushing and receiving) jammed it in on the next snap for a 21-7 count. Popular Wisconsin senator, William Proxmire-(D.), famed for his semi-satirical Golden Fleece awards, was politicking at the stadium Sun- day, and he might have handed out a special award to the officials after they evidently fleeced the Bucs. An apparent incomplete pass to Wilder at the Packer 5 was ruled a catch and a fumble, and linebacker George Cumby chugged 68 yards with the football. "It was just a bad play all around," said Wilder. A costly facemask penalty on cornerback Mike Washington, overcame a groin injury to go the distance, gave Green Bay a 34-yard field goal by Jan Stenerud. But that was all. Interceptions by Colzie, Scot Brantley (at the goal line) and Green kept the Packers' point total frozen at 10.